Alaska is a state in the United States of America located in the north-west part of North America. There are Beaufort and Chukchi seas to the north from Alaska. There is the Pacific Ocean to south-west and the south from Alaska and it is known as the largest state in America, considering its area. It is also on the seventh place being one of the largest subnational division in the world, as well as on the third place for being one of the least populous and the most sparsely populated state. Nevertheless, Alaska’s population is about 738432 people, which is more than quadrupling the combined populations of Greenland and Northern Canada. 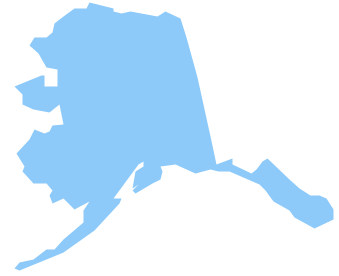 About half of Alaska's residents live in the so-called “Anchorage metropolitan area”. The economy of this state is supported by the natural gas, fishing as well as oil industries. Tourism along with military bases are a significant part of Alaska’s economy as well. The United States of America got Alaska from the Russian Empire in 1867, paying 7,2 million USD which was about 4,74 USD per square kilometer. The area went through several administrative changes before becoming organized as a “territory” of the USA in 1912. Alaska was admitted as the 49th state of the United States of America in 1959. Alaska is the only so-called “non-contiguous” state of the United States of America in North America. There are about 800 kilometers of Canada separating Alaska from Washington, which is another state of America, so it is technically a part of the continental America, but sometimes it is not included in the colloquial use. Alaska is not a part of the so-called “contiguous America”, known also as “the Lower 48”. The capital city of Alaska is Juneau, situated on the mainland of the North American continent. Although, Juneau is not connected to the rest of the North American highway system, so you can never get there by road. The state of Alaska is bordered by British Columbia and Yukon in Canada to the east. There is the Pacific Ocean, as it was already mentioned, to the south and south-west, as well as the Gulf of Alaska. The Bering Strait, the Bering Sea and Chukchi Sea are to the west and there is the Atlantic Ocean to the north from Alaska. Territorial waters of Alaska are in touch with Russia's territorial waters in the Bering Strait: the Alaskan Little Diomede Island and Russian Big Diomede Island are only 4,8 kilometers apart. Alaska has a longer coastline than all the other states of America combined and it is the largest state in the United States by its total area being 663268 square miles large, which is over twice the size of the State of Texas. Taking into consideration of Alaska’s territorial waters, this state is larger than the combined area of Montana, Texas and California. There are officially defined six widely accepted regions of Alaska, which are South Central Region (includes the Matanuska-Susitna Valley, the Kenai Peninsula and Anchorage), Southeast Region (closest to the rest of the United States, dominated by the Alexander Archipelago and the Tongass National Forest, which is the largest national forest in the United States) and four other regions, which will be mentioned later. 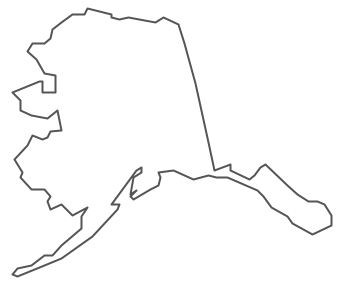 Southeast Region contains the state capital Juneau as well as the former capital Sitka. It also includes Ketchikan, which was some time ago Alaska's largest city. The Interior is another region of Alaska and it is also the largest region of this state. There is Fairbanks, which is the only large city of this region of Alaska. Once you are here, you can visit “Denali National Park and Preserve”, located in this region, where the highest mountain in North America (Denali) is. Southwest Alaska is the fourth region of Alaska, sparsely inhabited and stretching 800 kilometers inland from the Bering Sea. Most of the population of Southwest Alaska lives along the coast and there is a Kodiak Island also in this region. One of the largest river deltas in the world can be found here in this region, which is called “Yukon-Kuskokwim Delta”. The portions of the so-called “Alaska Peninsula” are known as a part of Southwest, including the remaining portions with of Aleutian Islands. The North Slope region of Alaska is the most tundra region covered with small villages. This area is known for its massive reserves of crude oil. It also contains both the Prudhoe Bay Oil Field as well as National Petroleum Reserve-Alaska. The northernmost city in the United States of America is also in this region and it is called Barrow. The Northwest Arctic area includes the Kobuk River valley and it is often regarded as being also a part of this North Slope region. The Aleutian Islands is the last region we want to mention and it consists of over 300 small volcanic islands making up this chain and stretching over 1,900 kilometers into the Pacific Ocean. Some of the mentioned islands fall in the Eastern Hemisphere. Two of these islands, which are Kiska and Attu, were occupied during World War II by Japanese forces. If you decide to create a map of Alaska, mentioning its regions, rivers, mountains, population and other factors, then it can be very useful for you to use ConceptDraw DIAGRAM software as a simple in use and very convenient tool for making such drawing. Having ConceptDraw DIAGRAM application can simplify your work with creating such maps, mentioning the cities and other features of the chosen state and it can take only a few minutes to draw a needed map, especially in case you have ConceptDraw STORE as another product of CS Odessa which was developed for a purpose of making the process of creation the schemes and plans, as well as map, charts, diagrams and flowcharts, fun and entertaining, providing all of the needed tools, including the examples of pre-made maps and stencils from the libraries. Having the “Continent Maps solution”, which can be downloaded both from “Maps area” of ConceptDraw Solution Park on this site or from ConceptDraw STORE, is a helpful thing to have, as this solution includes the vector stencils library “Alaska”, which contains the contours of Alaska state which all can be used while working in ConceptDraw DIAGRAM diagramming and vector drawing software. Use the Alaska library to draw thematic maps, geospatial infographics and vector illustrations for your business documents, presentations and websites. Alaska has a population of over 0.7 million and an area 663,268 sq mi(1,717,856 km2). The United States of America, is a federal republic composed of 50 states, a federal district, five major territories. 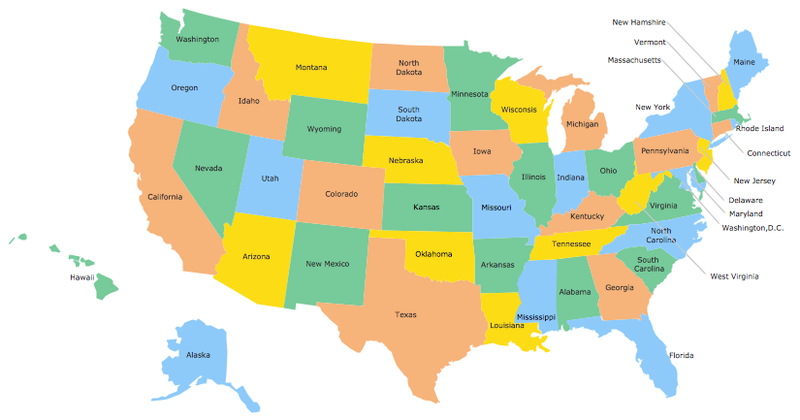 Use the map contours library "United States of America" to design thematic maps using the ConceptDraw DIAGRAM diagramming and vector drawing software. The vector stencils library "United States of America" contains 53 map contours: US political map, map contours of states. No one can imagine a geography class without such educational stuff as a geo map or a globe. As for one of the biggest countries in North America, the United States of America Map is present in every American school or college. It’s easier to remember all the states if you look on the map more often. 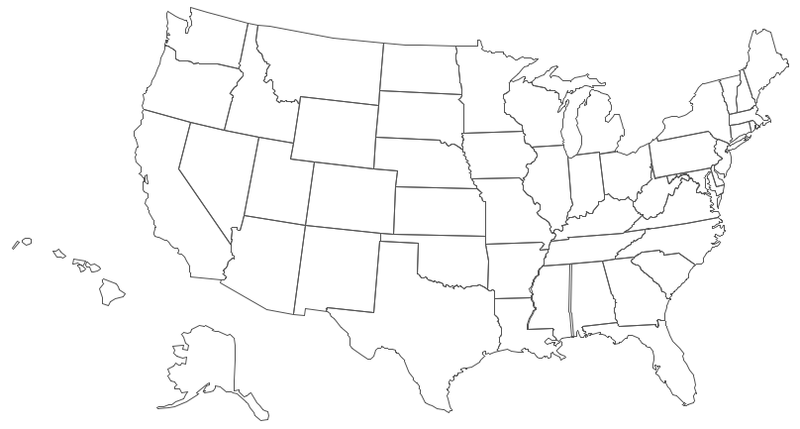 The following sample represents the map of USA. This precise map has names of all states of America. 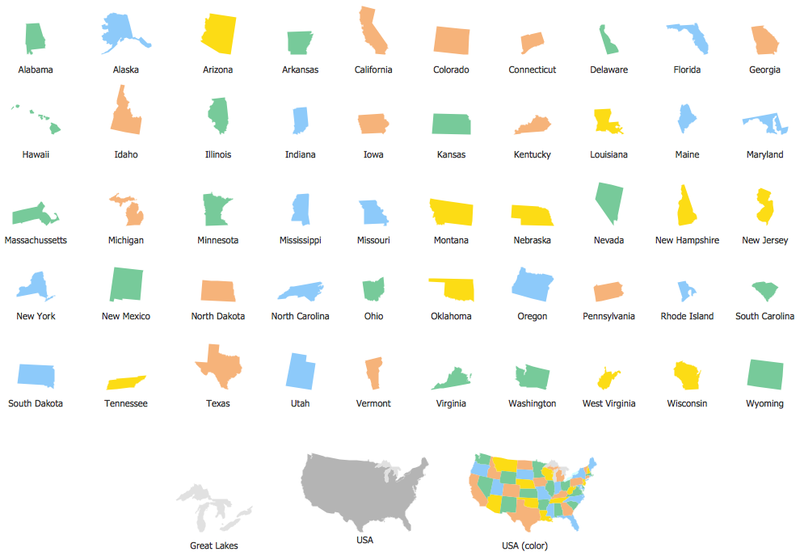 The different colors which are used to indicate each state add the visuality and brightness to the whole map. 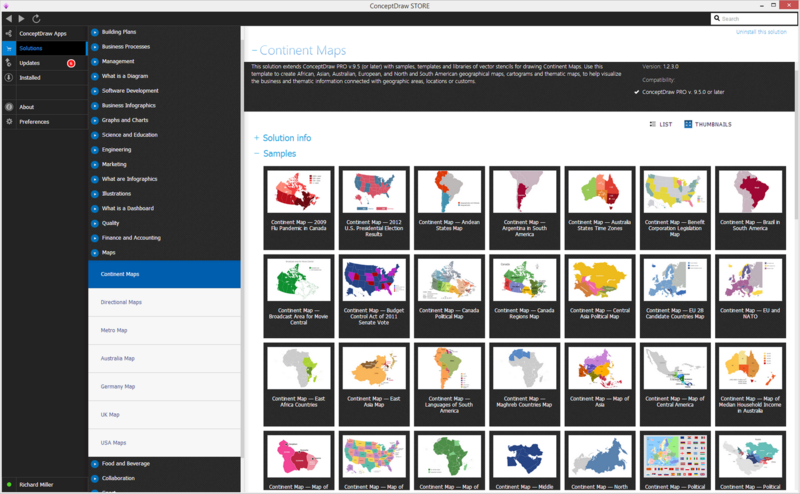 The ConceptDraw USA Maps solution - one of a family of ConceptDraw Maps solutions. Any country invokes a big piece of data: geographical, political, statistical, etc. A simple way of representing this data is to design maps that will show a certain item in relation to a particular area of Earth. Oregon is a state in the Pacific Northwest of the United States. The vector stencils library Oregon contains contours for ConceptDraw DIAGRAM v12 diagramming and vector drawing software. This library is contained in the Continent Maps solution from Maps area of ConceptDraw Solution Park. West Virginia is a U.S. state located in the Appalachian region of the Southern United States. The vector stencils library West Virginia contains contours for ConceptDraw DIAGRAM v12 diagramming and vector drawing software. This library is contained in the Continent Maps solution from Maps area of ConceptDraw Solution Park. South America includes 12 sovereign states. ConceptDraw DIAGRAM v12 is idea to draw the geological maps of South America continent from the pre-designed vector geo map shapes. Use Continent Maps solution from the Maps area of ConceptDraw Solution Park to draw thematic maps, geospatial infographics and vector illustrations for your business documents, presentations and websites. The Americas are the combined continental landmasses of North America and South America, in the Western Hemisphere. There are 35 sovereign states in the Americas. ConceptDraw is idea to draw the geological maps of America from the pre-designed vector geo map shapes and vector images map of america. Use Continent Maps solution from the Maps area of ConceptDraw Solution Park to draw thematic maps, geospatial infographics and vector illustrations for your business documents, presentations and websites. California is a state located on the West Coast of the United States. The vector stencils library California contains contours for ConceptDraw DIAGRAM v12 diagramming and vector drawing software. This library is contained in the Continent Maps solution from Maps area of ConceptDraw Solution Park. Yukon is the westernmost and smallest of Canada's three federal territories. Whitehorse is the territorial capital. The vector stencils library Yukon contains contours for ConceptDraw DIAGRAM v12 diagramming and vector drawing software. This library is contained in the Continent Maps solution from Maps area of ConceptDraw Solution Park. Louisiana is a state located in the southern region of the United States. The vector stencils library Louisiana contains contours for ConceptDraw DIAGRAM v12 diagramming and vector drawing software. This library is contained in the Continent Maps solution from Maps area of ConceptDraw Solution Park. Mississippi is a U.S. state located in the Southern United States. The vector stencils library Mississippi contains contours for ConceptDraw DIAGRAM v12 diagramming and vector drawing software. This library is contained in the Continent Maps solution from Maps area of ConceptDraw Solution Park.